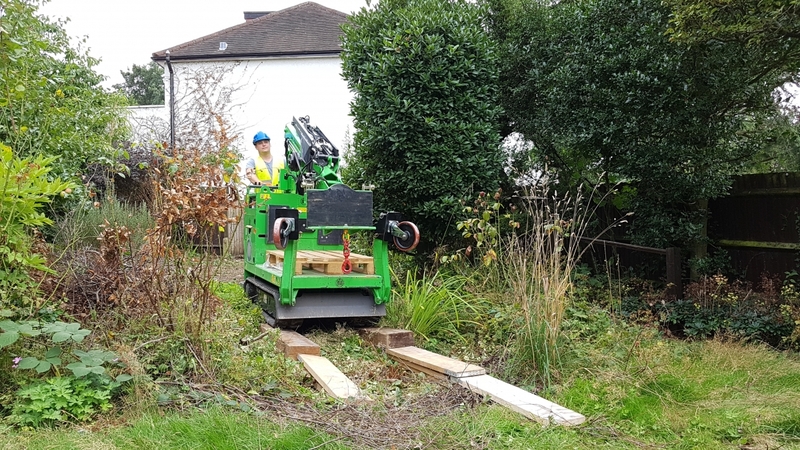 Hire the Hooka mini tracked crawler crane and take the strain out of moving heavy materials for your landscaping project. 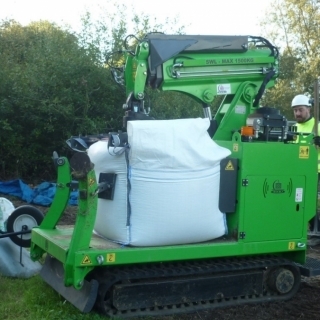 Lifts and carries bulk materials from the roadside into the heart of any site! 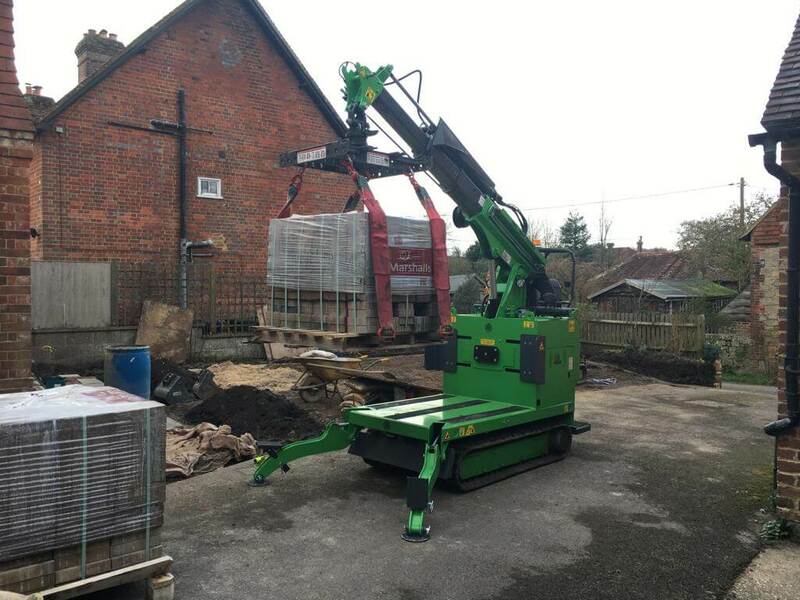 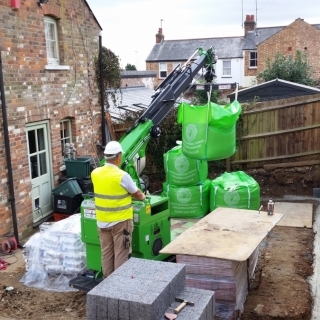 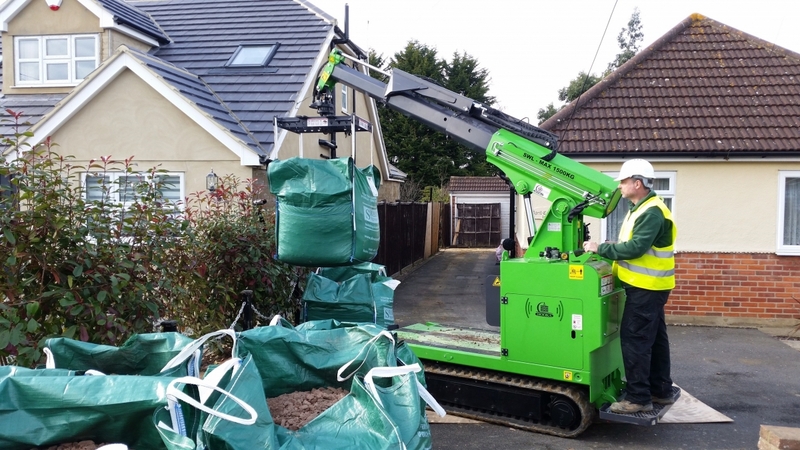 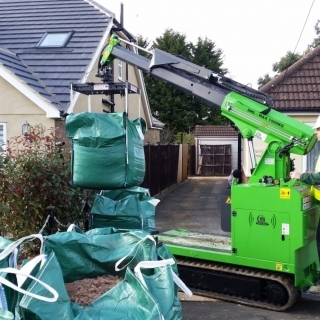 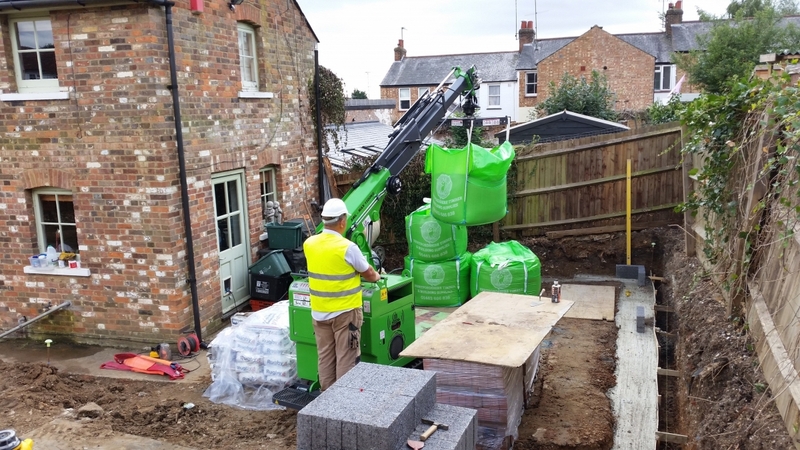 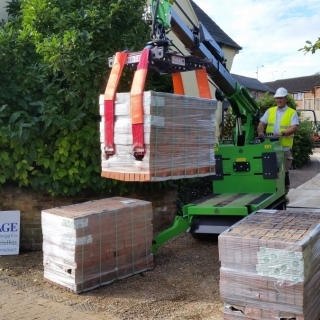 Safely lift and carry all types of materials such as bulk bags and pallets of blocks up to 1.5 tonnes. 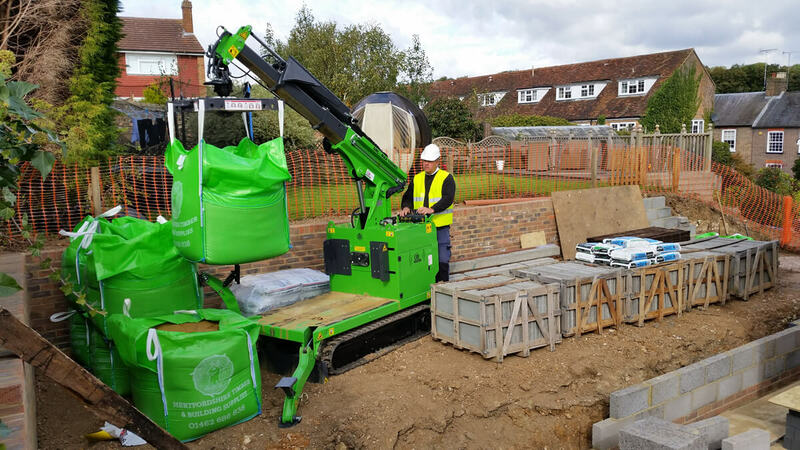 Below you will see examples of the Hooka quickly, efficiently and safely helping with the delivery of bulk materials weighing up to 1.5 tonnes to anywhere on your site ready for use. 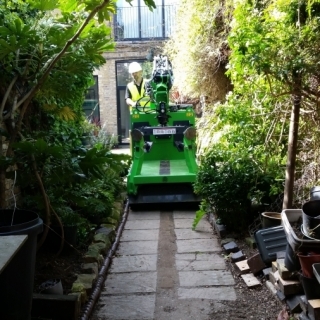 The Hooka was hired for a landscaping job in Winchester, Hampshire. 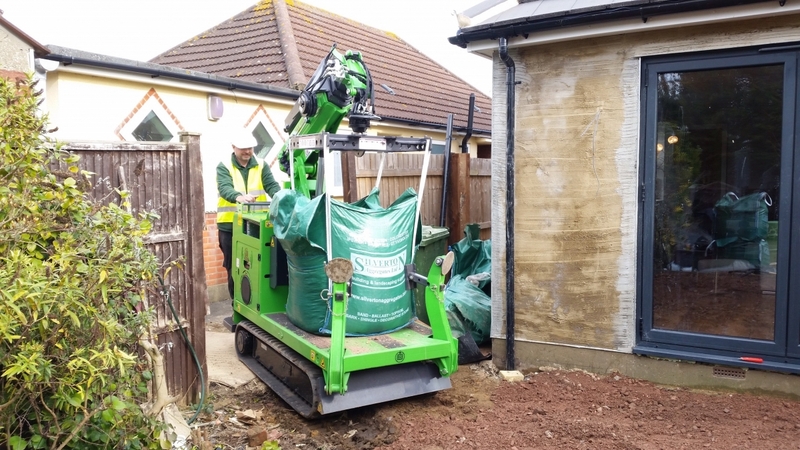 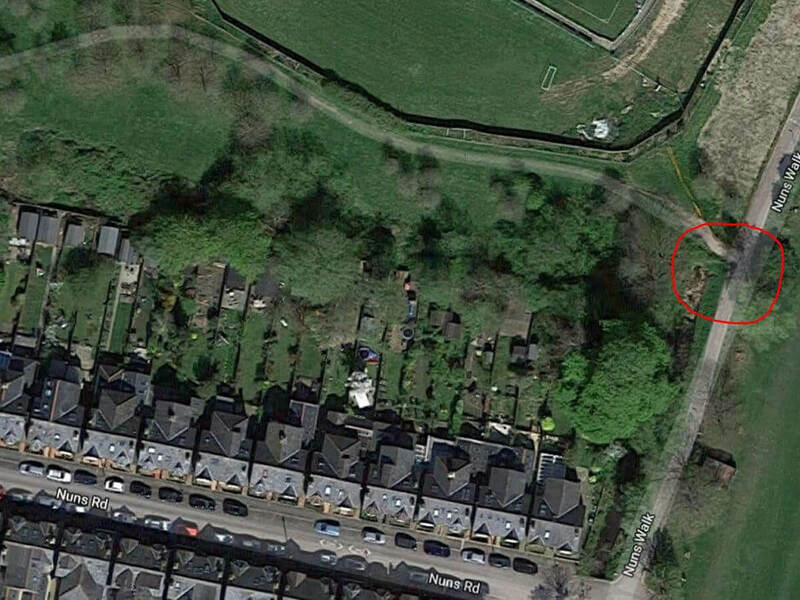 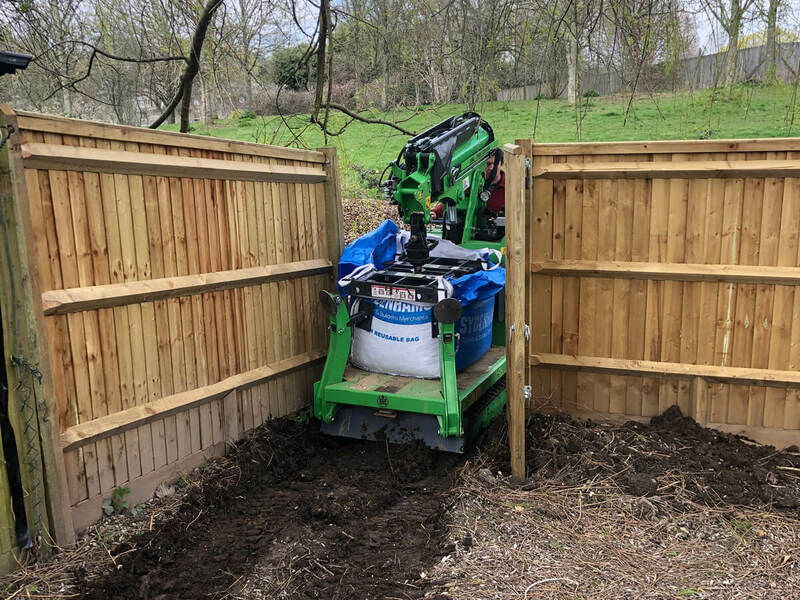 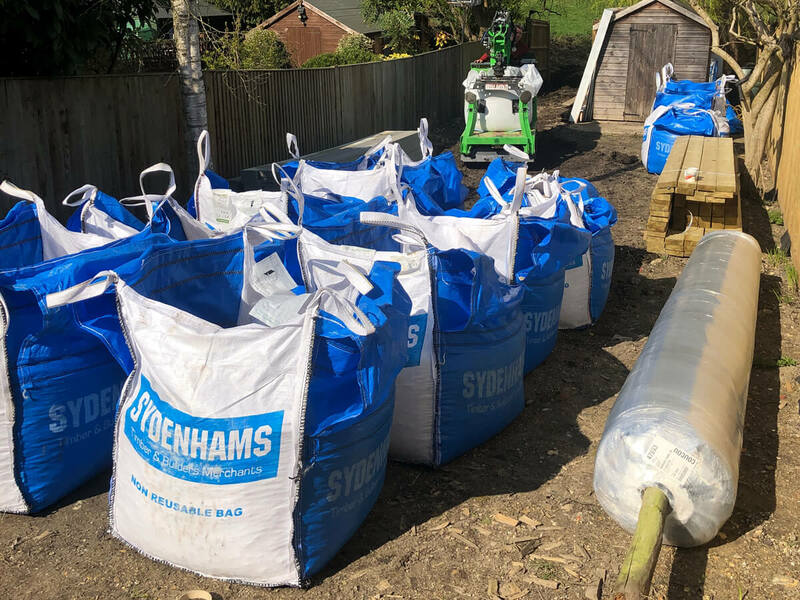 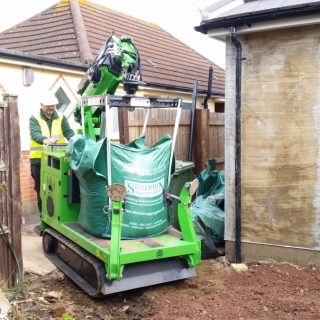 The delivery point for the 15 x 1 tonne bags of landscaping materials, 800kg pack of decking timber, 1200kg pack of composite decking planks, 300kg of artificial grass and 1 pallet of cement was quite a distance from the property and access was through a garden gate just over a metre wide. 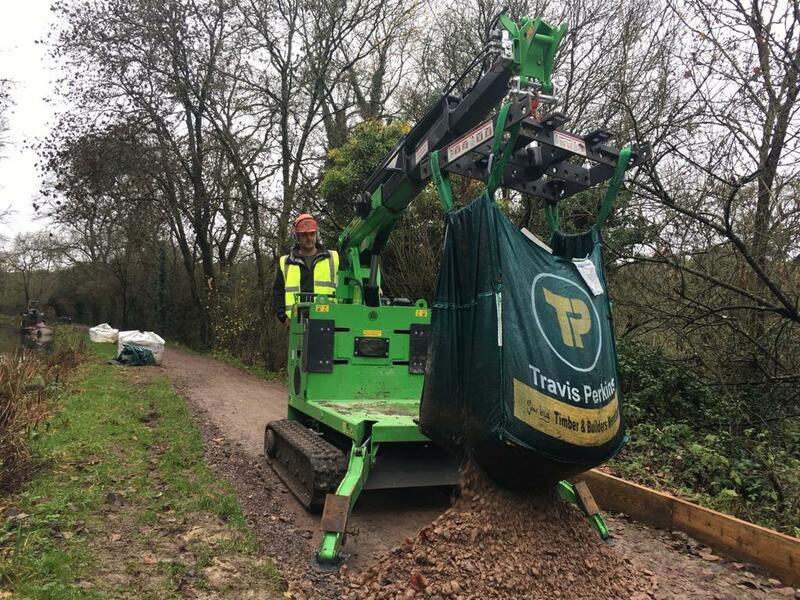 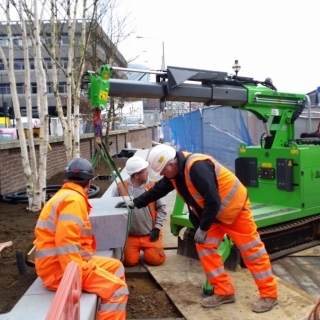 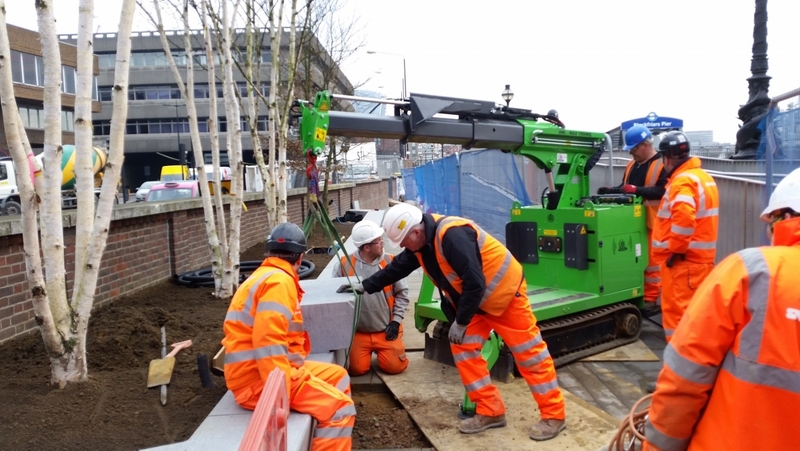 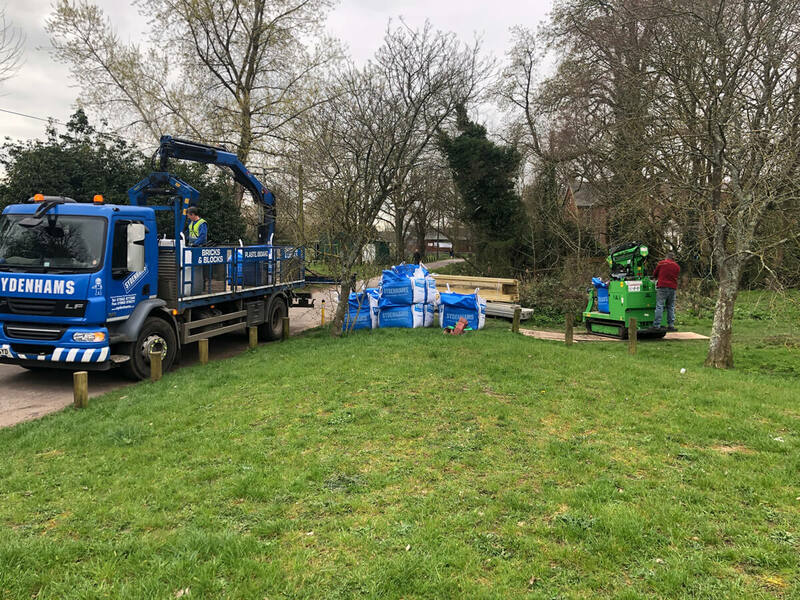 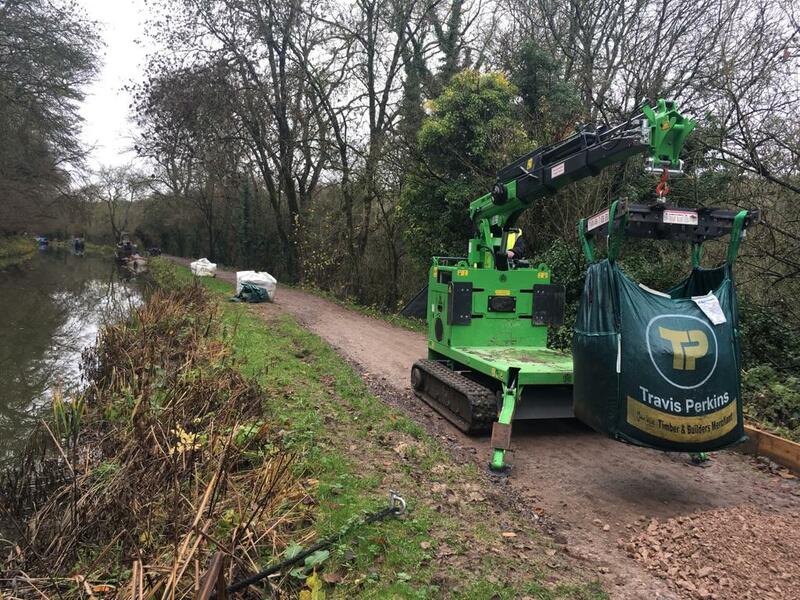 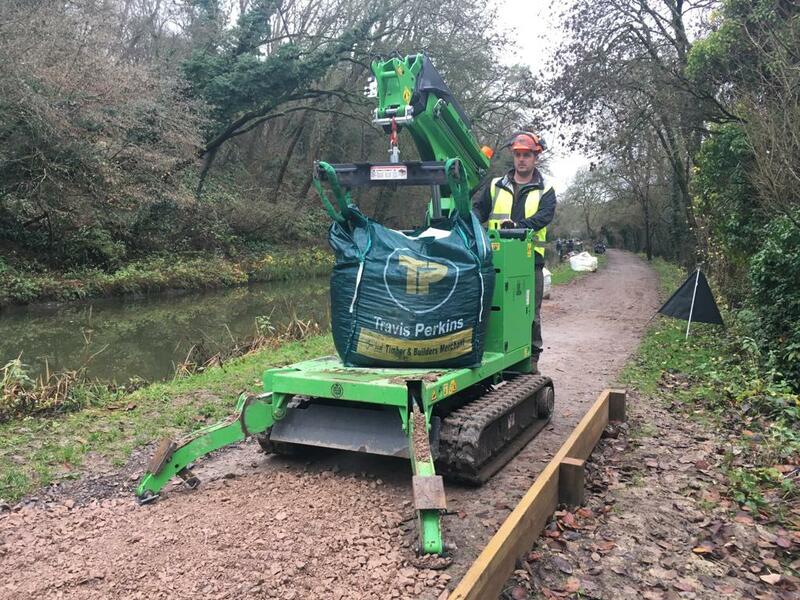 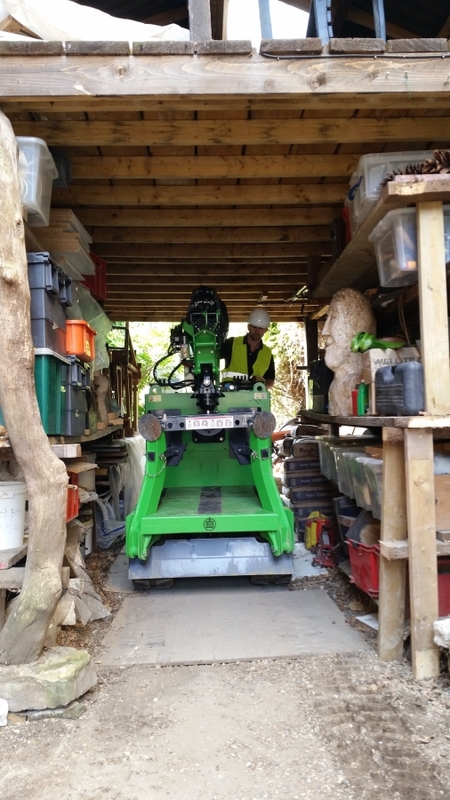 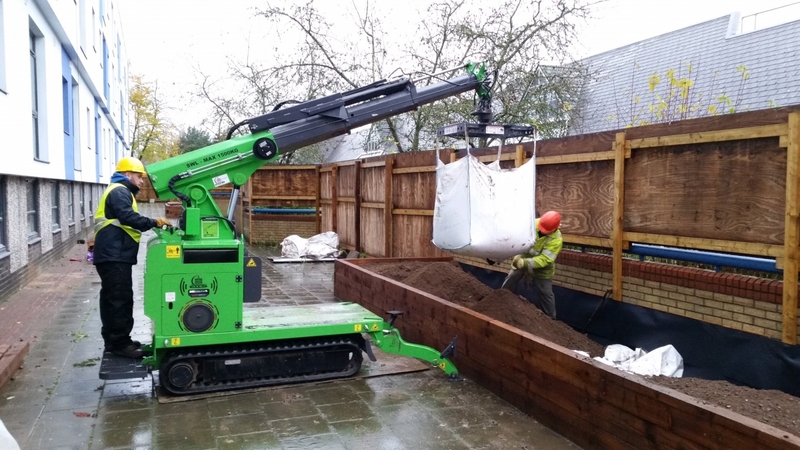 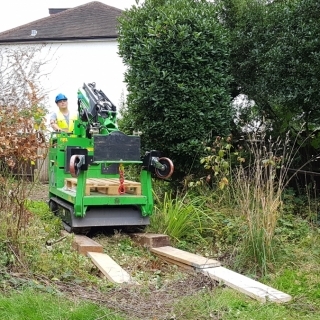 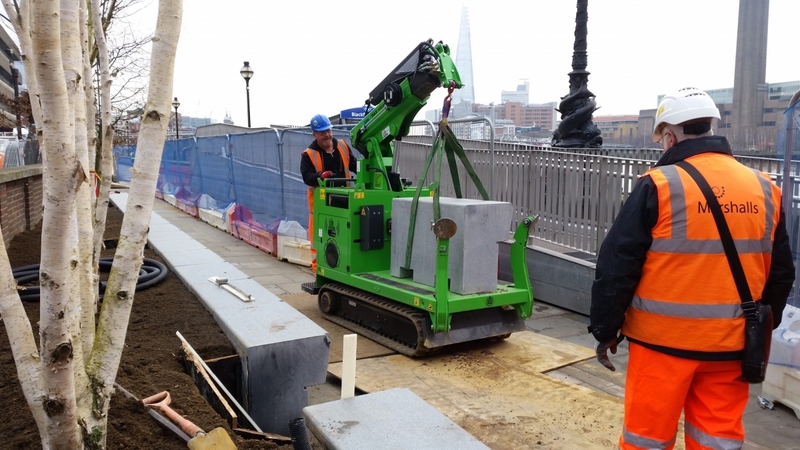 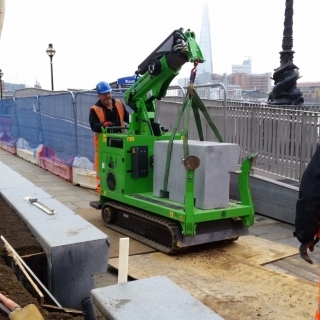 The Hooka mini tracked crawler crane was hired by the Canal and River Trust to safely and easily move bulk landscaping materials for their Towpath Reinstatement Scheme. 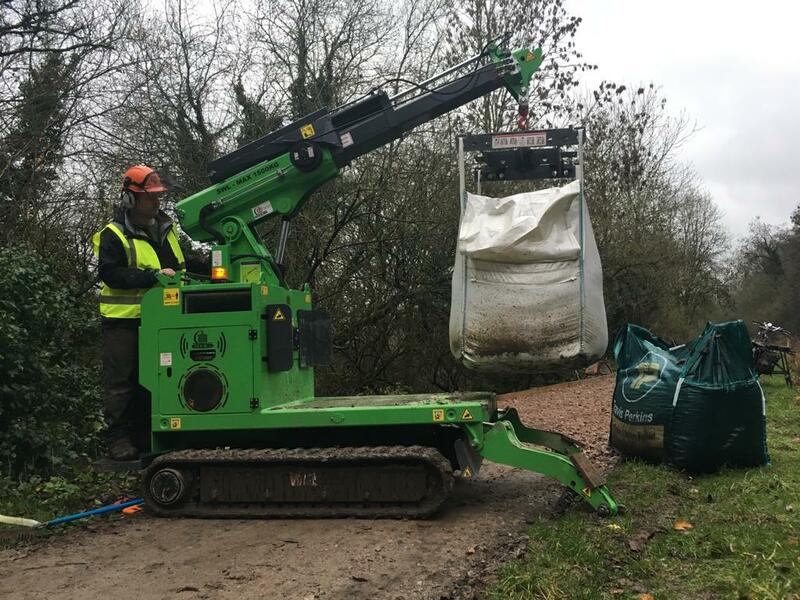 The heavy bulk bags needed to be transported nearly two miles from the nearest road access point to where the canal towpath had eroded. 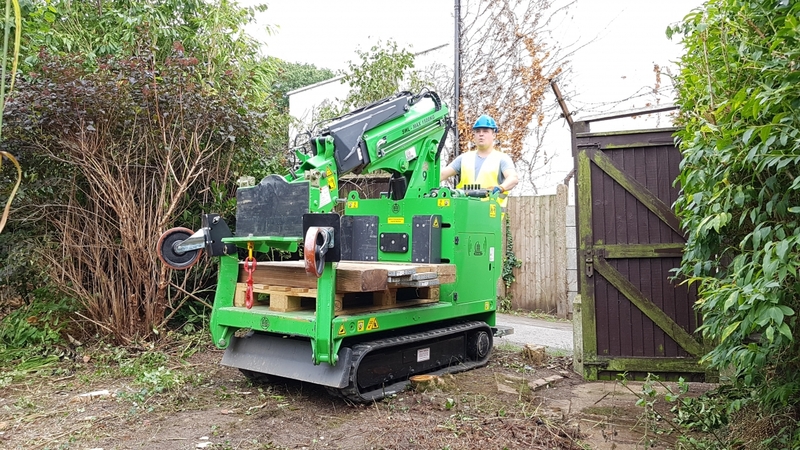 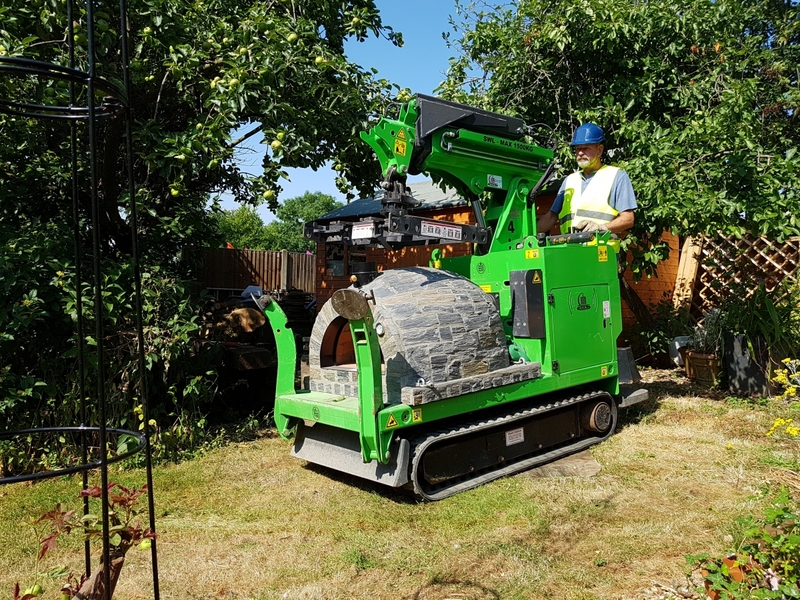 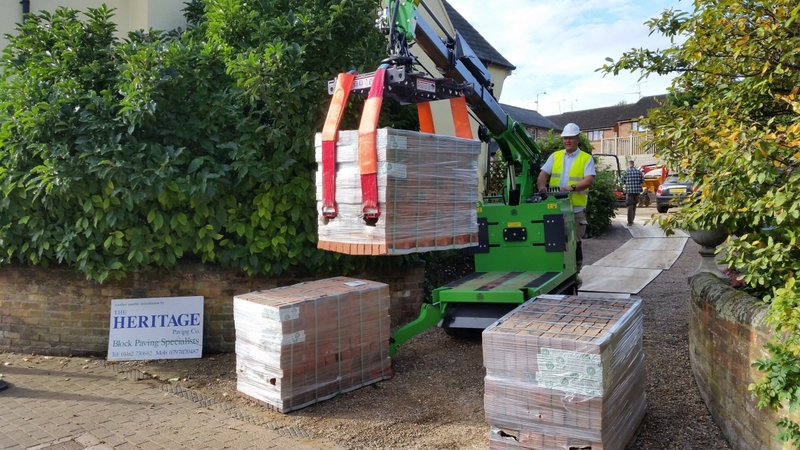 The Hooka was hired by the Whyteleafe Paving Co. to move 6 heavy pallets of paving blocks to the exact point of use from the roadside location the pallets were delivered. 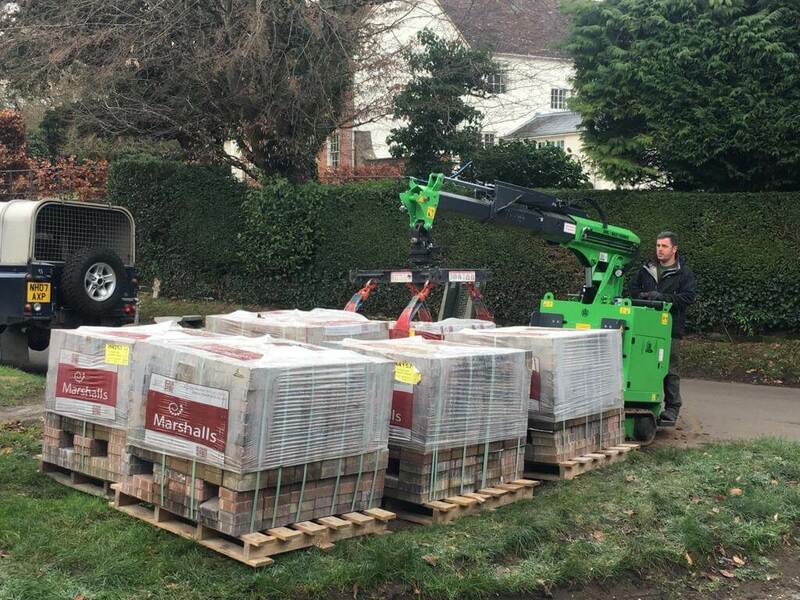 No manual handling required to get approximately 2160 Marshall paving blocks on to the site ready for use. 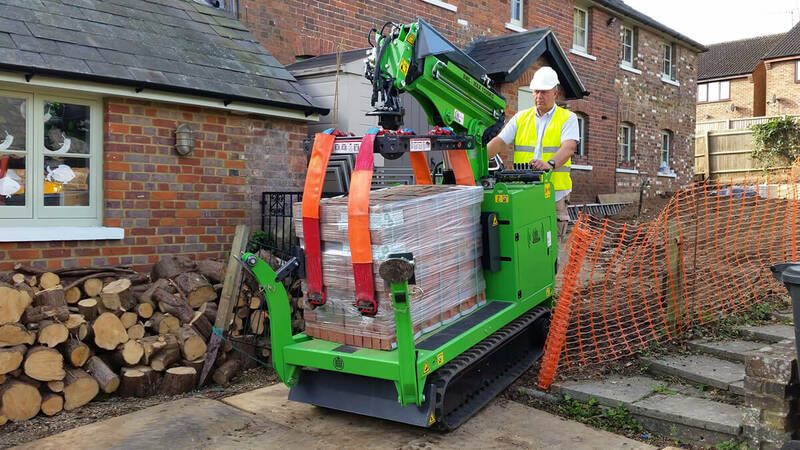 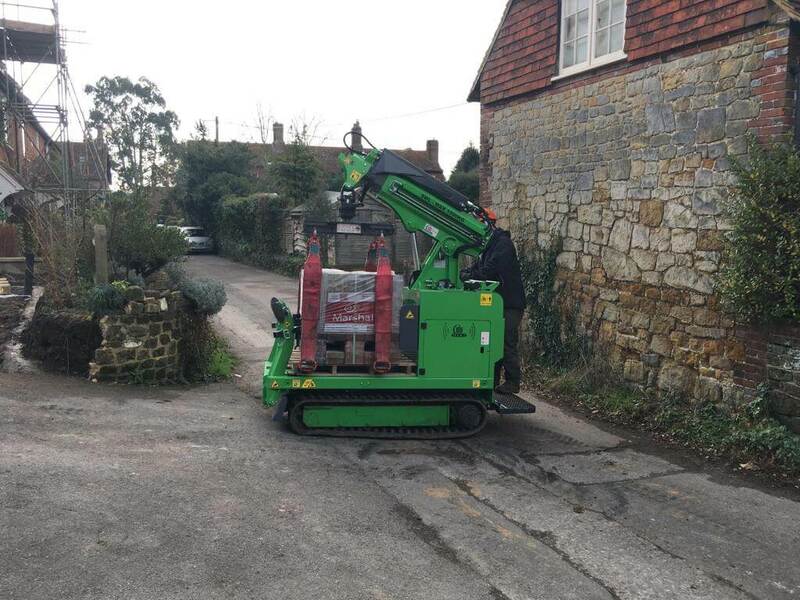 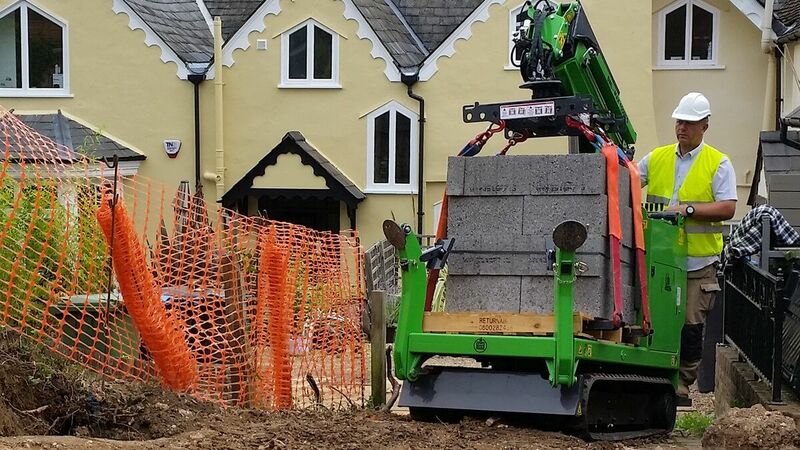 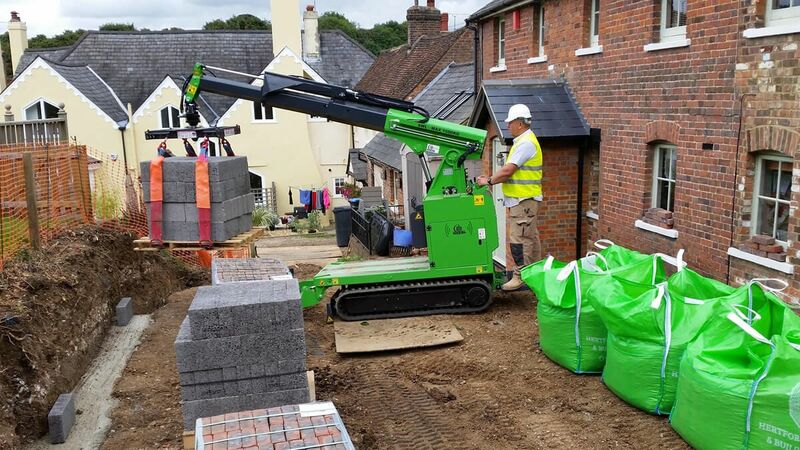 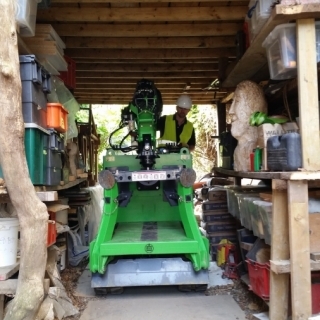 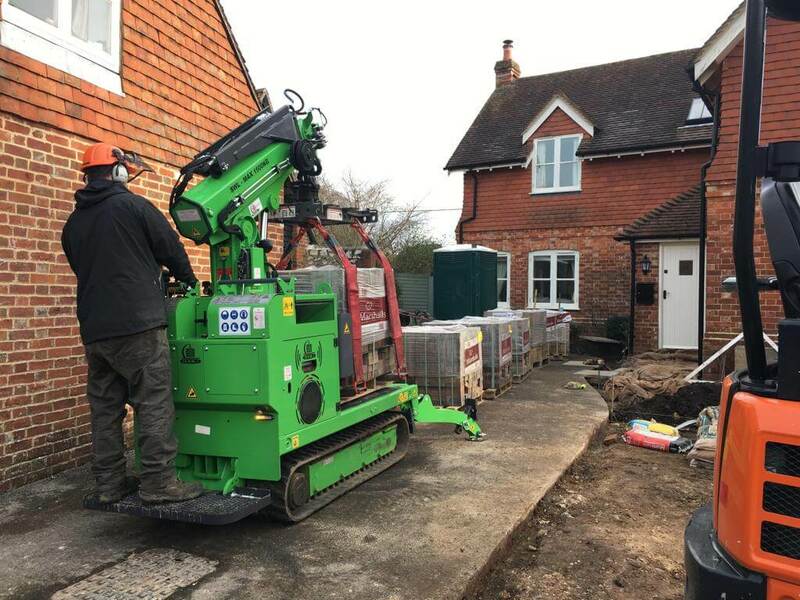 The delivery lorry could not reach the property, down a narrow lane, so the Hooka was used to safely and easily move the packs of blocks 200 metres to the property in Midhurst, West Sussex. 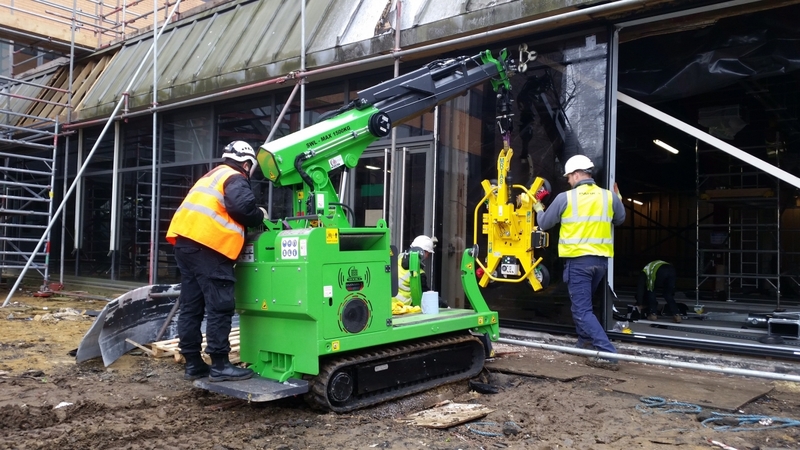 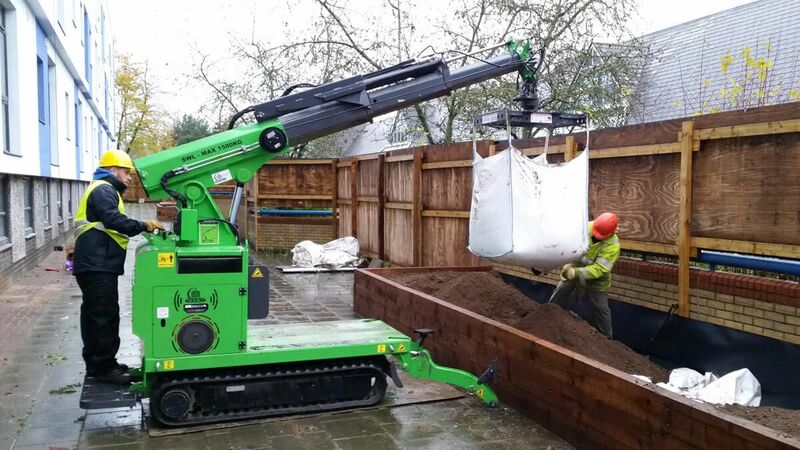 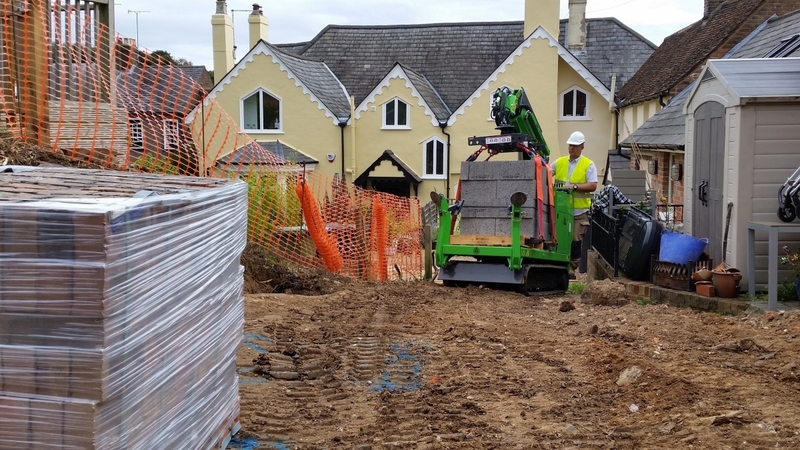 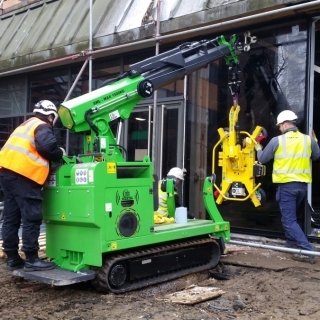 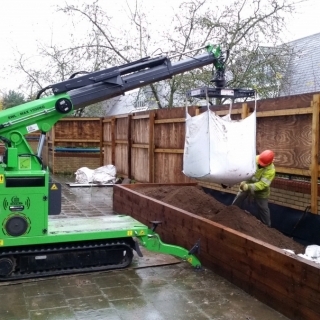 With its unique “Load-Lock” system, designed to hold bulk bags safely when moving over uneven ground, the Hooka mini tracked crawler crane delivers materials from the roadside to the point of use on any building site for a landscaping project. 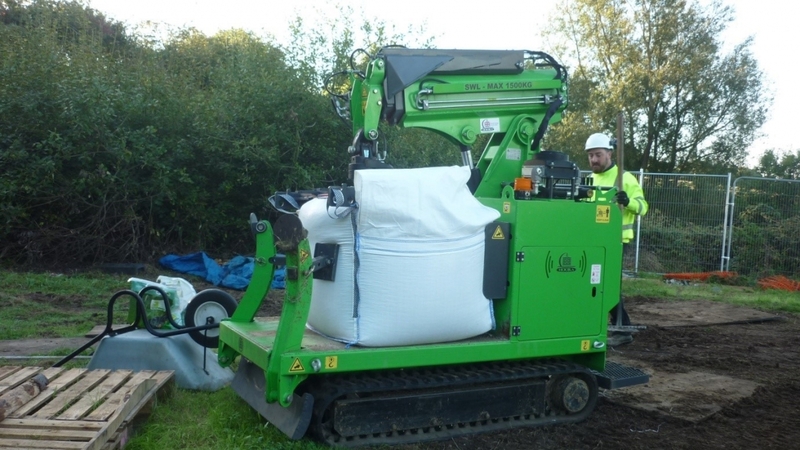 Safely lift and carry bulk materials on pallets across uneven terrain within landscaping sites. 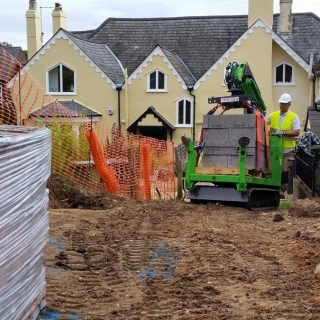 The rubber track system provides stability and a go anywhere capability. 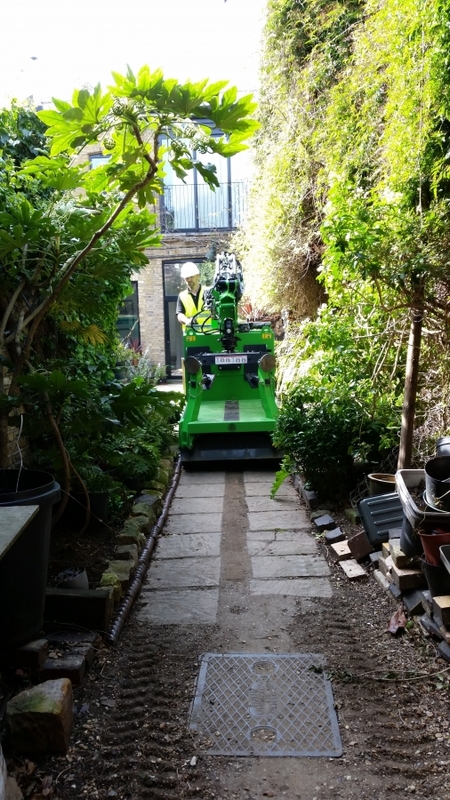 The Hooka is only 1 metre wide and can access some of the most restricted sites. 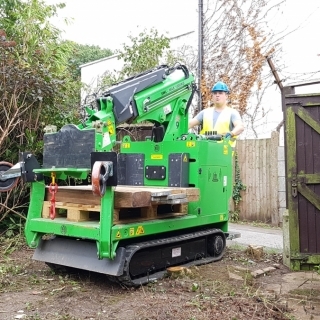 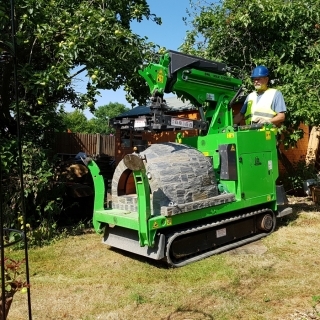 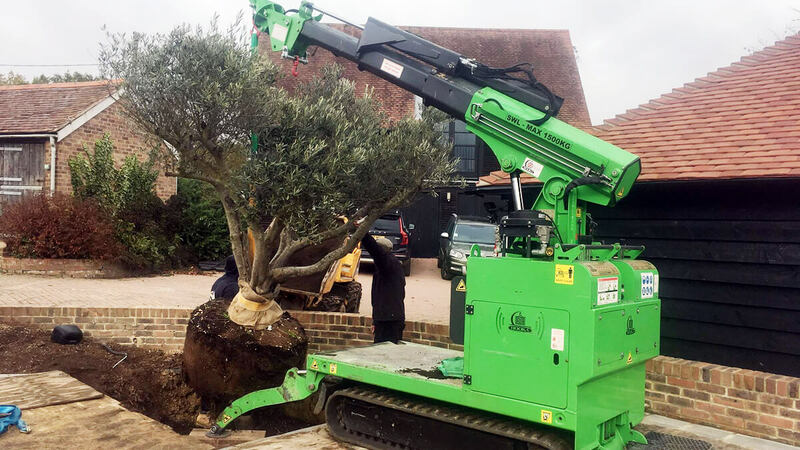 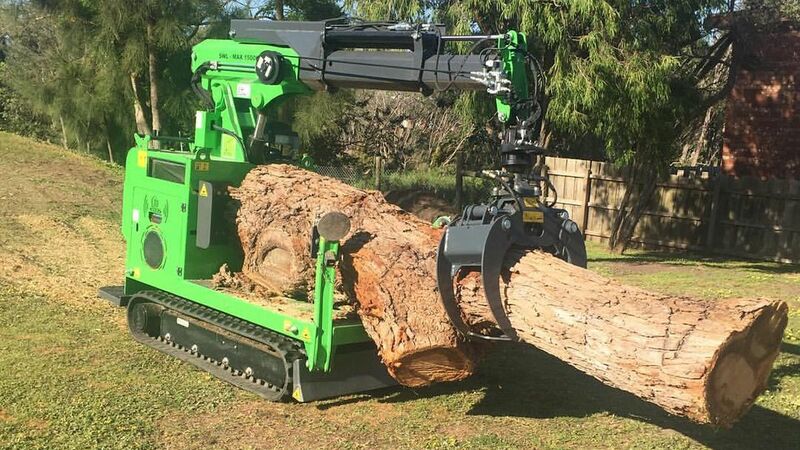 The Hooka mini tracked crawler crane was used to easily move and plant an 800kg rootball Olive tree. 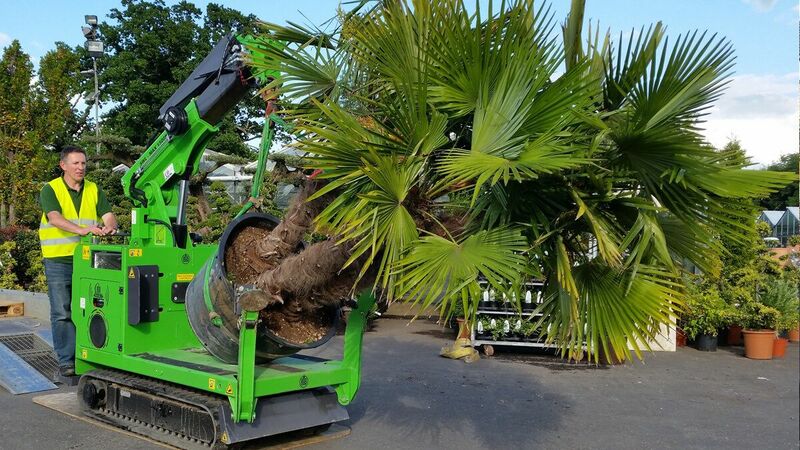 It also unloaded the tree from the trailer and safely transported it across the site to the desired place to be planted and then gently lower the tree into position. 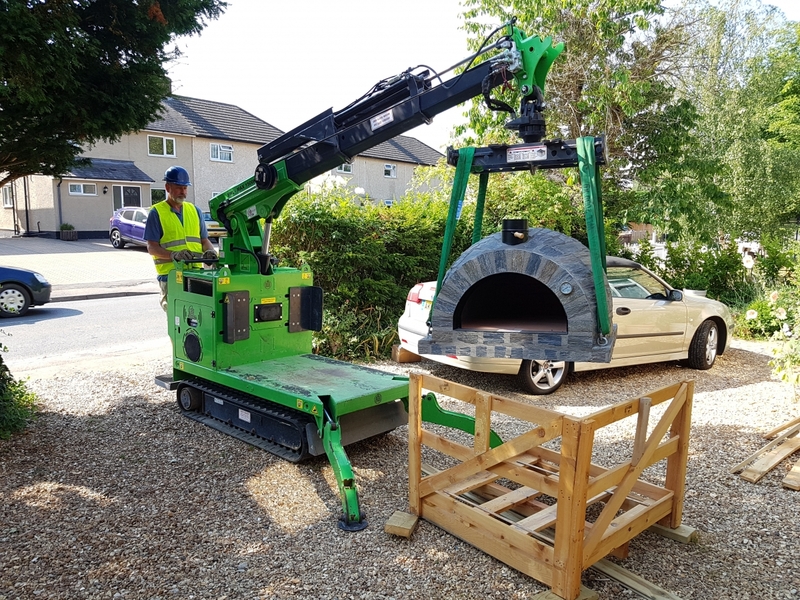 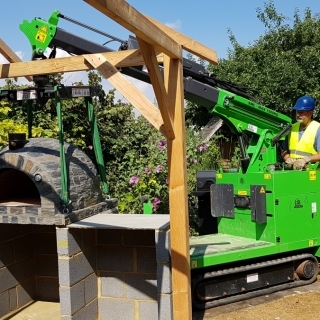 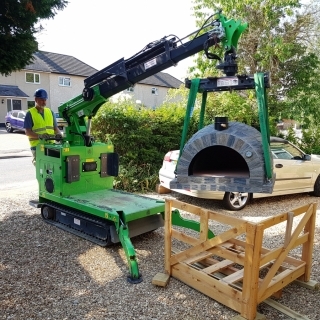 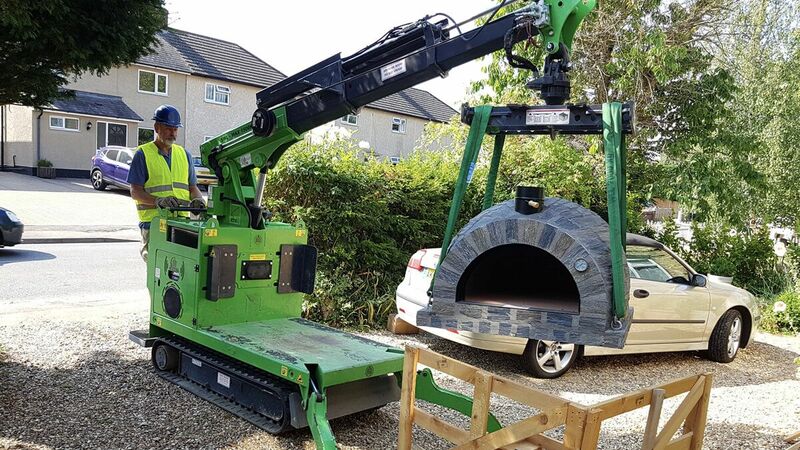 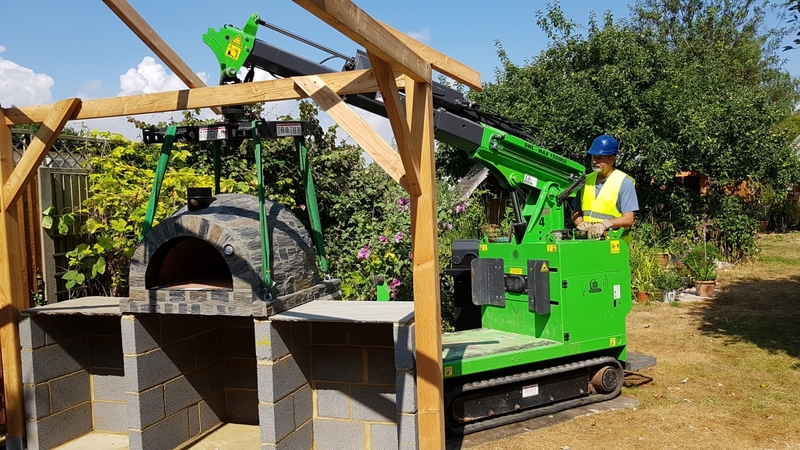 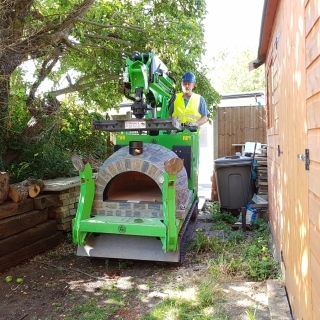 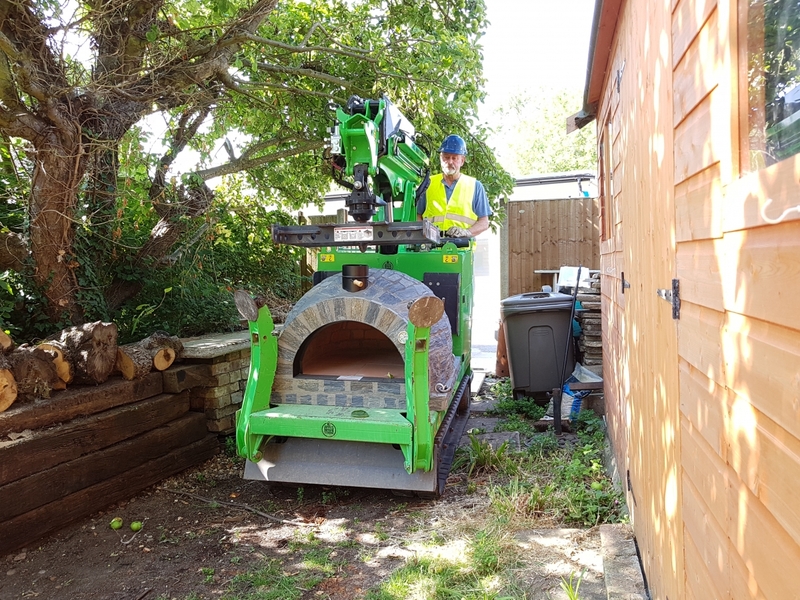 The Hooka was used to easily move and position a heavy pizza oven to an outdoor kitchen located at the rear of a property with restricted access.